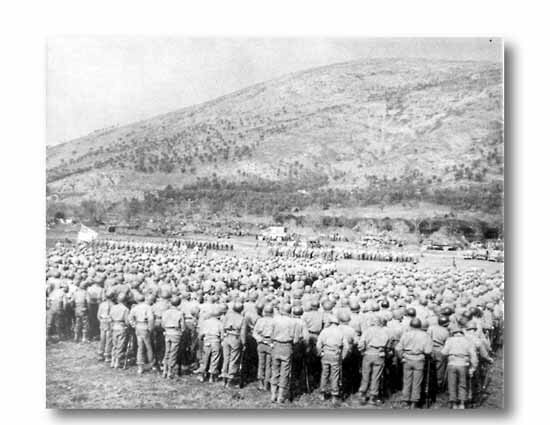 130 Division men were decorated in mass ceremony at Maddaloni area. Sgt. Kelly received his Congressional Medal of Honor. Late in February, the Division was relieved in the Cassino sector. Other than a few days in January, this was the first rest for T-Patchers since November 15. Replacements and refitting were sorely needed. At Piedmonte and Maddaloni, the Division engaged in an extensive program to weld together another strong fighting team. Terrain near Forino provided excellent ground for mountain training, while Qualiano's dustcovered turf added another realistic phase. Days of drilling were broken frequently by reviews and award ceremonies. It was a fast-moving "Texas" Division that reentered the line in May. A CASTLE STILL STANDS on its rocky ledge overlooking the centuries-old, walled town of Alife. CHARACTERISTIC OF MADDALONI was the mud. Pfc. Joe T. Lamb finds the company street tough sledding. It snowed, too!